The plane that the passenger said had no fuel when he attempted to start the engine for a flight to Port Kaituma. 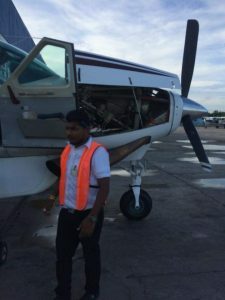 The Guyana Civil Aviation Authority (GCAA) is paying close attention to a claim by a domestic airline passenger that the pilot started a plane and then realised there was no fuel. “Boarded ASL flight for Port Kaituma a moment ago. Fastened seat belt and the captain turned the engine on and the plane refused to start. IT HAS NO FUEL. The Captain shouts No Fuel, No Fuel. I am shaking as I write this post. God is my protector,” said Supply Chain Manager, Cecil Gerrard Jacques on his Facebook Profile Wednesday morning. ASL’s Annette Arjoon-Martins later acknowledged that the pilot breached proper communication procedures. However, informed sources have reasoned that the pilot might have erred by shouting that there was no fuel because planes usually the technical process has more to do with the flow instead of unavailability. GCAA Director-general, Retired Lt. Col. Egbert Field seemed flabbergasted by the passenger’s account and said he would not be taking it lightly. “I don’t make joke with safety. This is very, very serious,” Field told Demerara Waves Online News. Commenting on Jacques’ account, Mark Conner said the pilot’s comment could easily have meant that there was no fuel flow to the motor. “There are both a low pressure and high pressure fuel pump that are needed to get and keep the motor running. If either one failed, it would not start and the fuel flow would indicate zero. The pilot may well have meant “no fuel flow”, not that the fuel tanks were empty. Unless a maintenance person drained the fuel tanks there is always some fuel in them, even if it was not as much as he wanted or needed, the motor would start,” Connor said. Dominic Mendes chided the pilot for shouting “no fuel” in an open cabin where the passengers can hear. “Just shutdown and then say to the passengers “sorry ladies and Gents there seems to be an issue, please could you disembark while we determine what the problem is thank-you” – Something like that would have been a lot less scary,” Mendes said.